Capt. 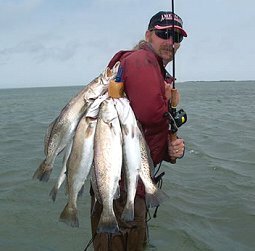 Rhett Price - Fishing the waters of Rockport, Baffin Bay and surrounding Coastal Bend areas for Speckled Trout and Redfish for the past seventeen years, fishing guide Capt. Rhett Price will make your Rockport Fishing Charter an enjoyable experience. From the novice to the veteran, from the bait fisherman to the lure fisherman, Speckled Trout and Redfish will fulfill your fisherman experience. Fly fishing is another growing and exciting method of testing your skills. 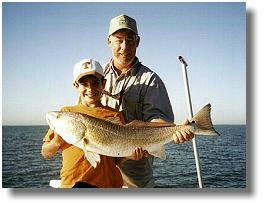 Capt Rhett has the experience and knowledge to customize your Rockport charter fishing trip. I invite you to come spend the day with me Capt. Robert Liebert on Galveston Bay system or Matagorda Bay system. 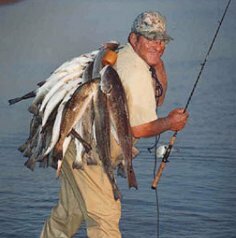 We well fish for the big three...Trout, Redfish, and Flounder. On these trips we can wade or drift and will have a fun safe trip. I have my Coast Guard license and Texas Guides license. We will be fishing out of my Kenner and all rods, reels and tackle will be provided. I have been fishing saltwater my entire life and have logged thousand of days learning and studying the big three. Family trips, corporate outings, buddy trips, or serious experienced trophy trout hunters. Parties of any size can be accommodated. Call 361 983-2003 to book your next trip! 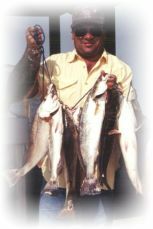 Captain Ranier Brigham is a full-time professional saltwater fishing guide who has been fishing the Seadrift and Port O�Connor area for over 40 years. Capt. 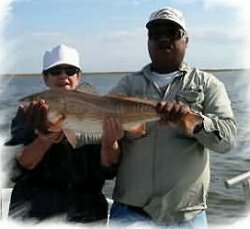 Brigham specializes in catching trophy redfish and trout and showing each and every customer an exciting, fun filled day on the water! Captain Brigham has the know-how to locate and put you on the fish. Capt. 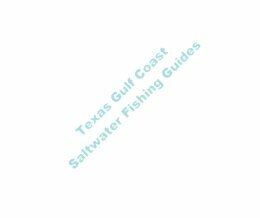 Brigham is a member of the Texas Saltwater Guide Association, is both U.S. Coast Guard Licensed #1027339 and Texas Parks and Wildlife Licensed and is insured. Capt. Terry Haun offers Offshore and Deeper Bay Waters fishing for Red Snapper, King & Spanish Mackerel, Cobia, Amberjack, Dorado, Sharks, Redfish and Speckled Trout. 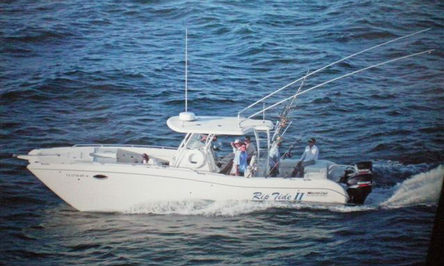 Offshore....WorldCat 330TE 34ft ...troll all day for billfish, tuna, wahoo, dorado, or kingfish. Tie up to a well for red snapper, ling, amberjack or kings. I was born and raised here in the Coastal Bend. Fishing is just away of life in Rockport. My boat is a 22 foot Bay Stealth powered by a 150 h.p. twin prop yamaha. I fish all area bays and flats.Bait and lure fishing. Families and groups are welcome. We can also handle a company needing several boats! For that last minute trip call my mobile number - 361-549-4389. 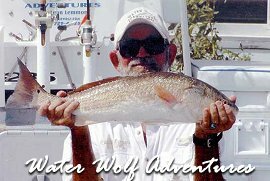 Water Wolf Adventures features one of the finest fishing adventures on the Texas Coast. 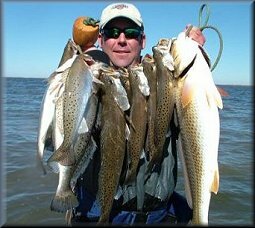 We specialize in both artificial and live bait fishing on the bay systems around the Coastal Bend. Whether you wade-fish, fish from the boat, live bait or artificial, we will strive to make your fishing trip one to remember. We are here to help you have a great trip out on the water. We will catch fish and have a lot of fun. The sunrises are breathtaking and the views of the water, reefs, and shorelines are second to none. We continually work hard to keep you on the fish, and usually do, but please remember only God can guarentee a limit of fish. 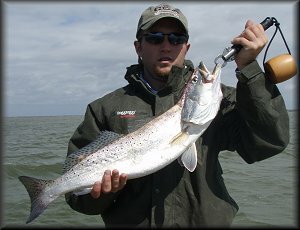 Fishing Guides, to sign up with Texas SaltwaterFishingGuides.com, just fill out FORM you will find HERE. Or you can just use the form as a guide for the information we would like to receive from you and mail such to the address below.